Errol Flynn, with Olivia de Havilland by his side, cleans up the wild West in Dodge City. The Stars: Errol Flynn, Olivia de Havilland, Bruce Cabot, Ann Sheridan and Alan Hale Sr. The Plot: Cattleman Wade Hatton (Errol Flynn) becomes the sheriff of the lawless old West town of Dodge City, Kansas. He battles the local crime boss (Bruce Cabot) while winning the heart of a local lady (Olivia de Havilland). Olivia de Havilland as Abbie Irving in Dodge City. Backstory: Westerns made a resurgence in the late thirties, with many studios looking to capitalize on the success of such hits as Wells Fargo (1937) and The Plainsman (1937). Warner Brothers decided to get on the bandwagon, by placing two of their leading actors in Westerns. James Cagney took on the old West in The Oklahoma Kid and swashbuckling star Errol Flynn was cast as an incorruptible sheriff in Dodge City. 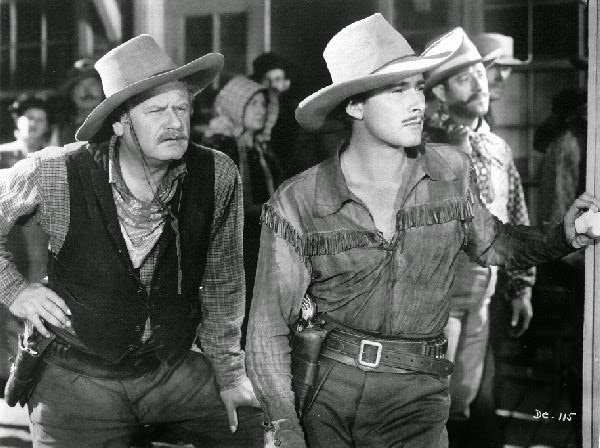 Alan Hale Sr. and Errol Flynn check out the bad guys in Dodge City. Best Performance: Errol Flynn as Wade Hatton. Flynn was never a great actor; in fact, he was really only a moderately decent one at the best of times, but, boy howdy, was he ever a movie star. Flynn's natural charm and charisma are on full display in Dodge City, making an essentially unlikable character -- Hatton has such a zeal for enforcing the law that he throws people in jail for tearing down signs -- an heroic figure. Henry Fonda gives a much more nuanced take on the lawman as avenging angel in My Darling Clementine (1946), but nobody could take on the baddies with the effortless cool of Flynn. Best scene: The only word for the famous barroom fight scene in Dodge City is "Wow!" Also, Alan Hale Sr. is an American treasure (clip below). Best Line: "There's no law West of Chicago, and West of Dodge City, there's no God," Dr. Irving (Henry Travers). Flynn, the Western Star: Flynn was known as the swashbuckling star of films like The Adventures of Robin Hood (1938) and Captain Blood (1935) before he made Dodge City. Flynn was reluctant to take on the part of a Western hero. The Australian Flynn never changed his mannerisms or posh diction to play cowboys, and, according to his autobiography, he never understood why the public "bought" him as a Western lawman. Nevertheless Dodge City was such a huge hit that he became a popular Western star, appearing in films like Santa Fe Trail (1940) and They Died With Their Boots On (1941). 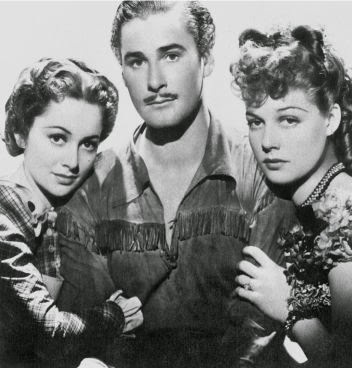 Olivia de Havilland, Errol Flynn and Ann Sheridan in a publicity still for Dodge City. 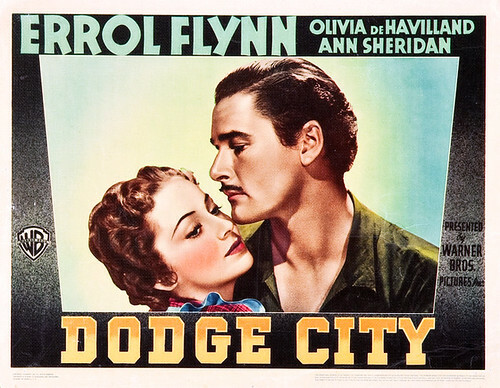 De Havilland and Flynn: Dodge City was the fifth of nine films that de Havilland and Flynn made together. 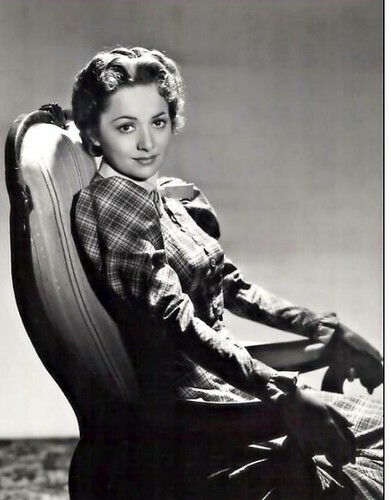 By this time, De Havilland was thoroughly tired of playing bland, love-interest roles opposite Flynn. She claimed to be so bored by the script that she couldn't even memorize her lines. 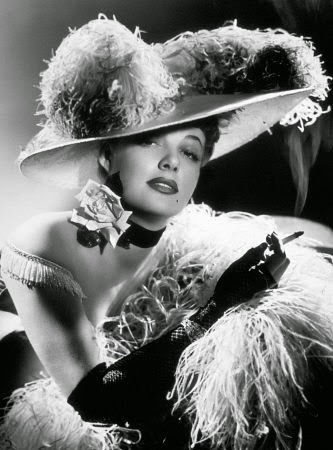 De Havilland got the chance to prove her acting chops in her next film role, playing Melanie Hamilton in Gone With the Wind. Fun Fact: 1970's country-rock band Pure Prairie League took their name from the temperance union Alan Hale Sr attends in Dodge City. Ann Sheridan as Ruby Gilman in Dodge City. Why it's essential: 1939 was a banner year for Westerns (Union Pacific, Jesse James, Frontier Marshal). While John Ford's Stagecoach was the genre's auteurist masterpiece, Dodge City is the populist action-adventure yarn that made a ton of money at the box office. Dodge City is a delight from beginning to end, filled with exciting action sequences and wonderful performances from many leading old Hollywood character actors (Victor Jory, Frank McHugh, Ward Bond). Availability: Dodge City is available on DVD and video on demand. Next week, Good Queen Bess falls for a ne'er do well in The Private Lives of Elizabeth and Essex.